Celebrate the natural, cultural and historical wonders of this extraordinary region as you take a unique glimpse into one of Australia’s best kept secrets. Get to know Darwin, the capital of the Northern Territory before heading into one of the world’s great nature reserves, Kakadu National Park. From here, you’ll be swept away by the magnificence of the Outback. Arriving in Western Australia, venture through ancient gorges, sink deep into stories thousands of years old and marvel at the beauty of the Kimberley region. 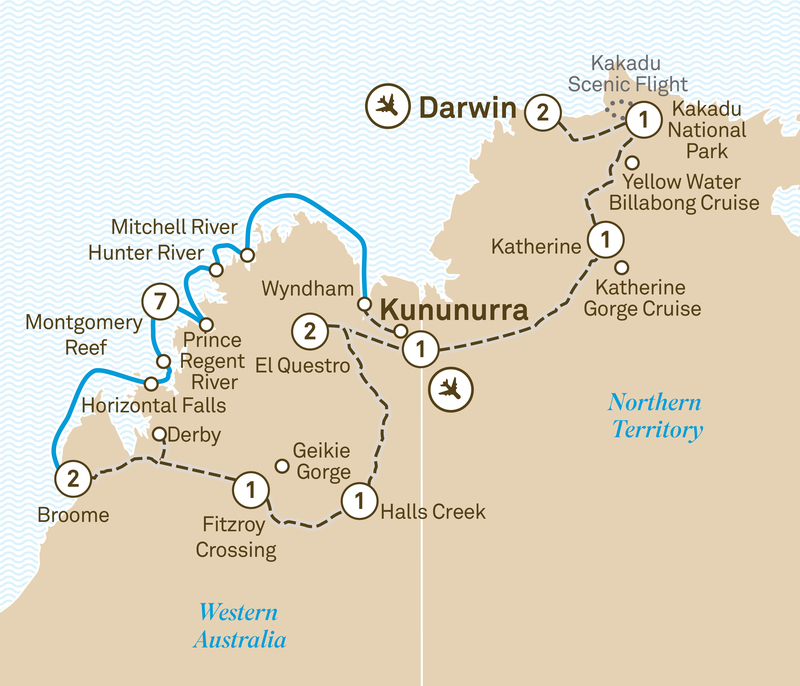 A cruise along the Kimberley coast on the luxurious True North is truly a once-in-a-lifetime experience. Wind your way along this extraordinary coastline, explore river systems and waterfalls, fish for ‘barra’ and discover beaches that will take your breath away. Encounter the oldest art known to mankind and spend time with traditional landowners. This afternoon, board your True North Kimberley Snapshot cruise.